What Type of Gaming Chair Is Best For You? 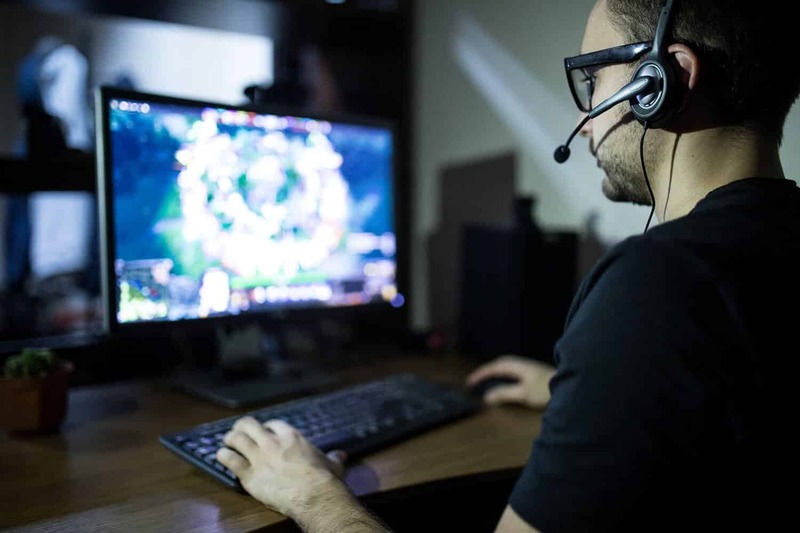 With games like Dota 2, League of Legends, and Fortnite dominating the top channels over on Twitch, there has never been a better time of being a gamer – and to make money from your passion! One of the most common things you see among streamers on Twitch are gaming chairs. 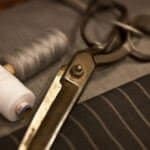 Their reinforced design and padding ‘in all the right places’ can ensure that you can grind on for hours with very little in the way of fatigue. 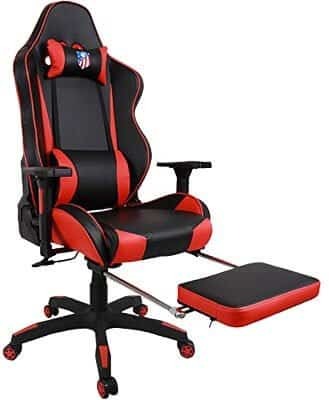 Many of the top gaming chairs on the market are typically suited for those with smaller frames – making them completely unusable for men with larger frames or body sizes. 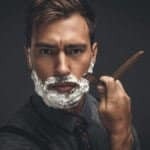 Therefore, we wanted to help our fellow man out and round up a list of some of the best gaming chairs on the market that have been designed from the top down to fit larger men. Comfort is important when you spend long hours in front of a computer. The right computer chair can make all the difference, especially when it comes to your spinal health. Additionally, if you are of a larger frame, finding a chair that suits your needs can be especially difficult. 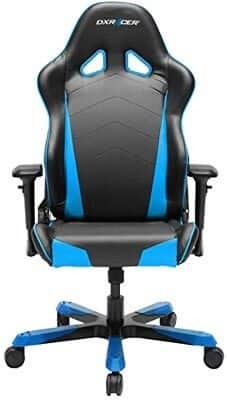 The DXRacer computer chair is ergonomically designed to give you the most support while also being exceptionally sturdy and fashionably stylish. This computer chair is ideal for those individuals that spend a large part of their day sitting at a desk, whether it be for work or for play. 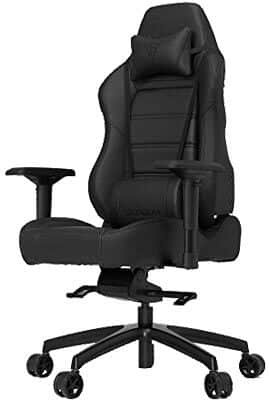 The DXRacer features a wider back rest and a lumbar cushion for support, which will help with your posture. It can withstand weight up to 300 pounds, and the backrest leans back up to 120 degrees for maximum comfort while you work. The armrests are straight, and help to support your wrists at rest. Unfortunately, the armrests are not padded like the rest of the chair. The wide set aluminum base helps to prevent tipping when you lean, so it is a sturdy, bulky, heavy duty chair. DXRacer is one of the more popular gaming office chair brands on the market, and rightfully so. 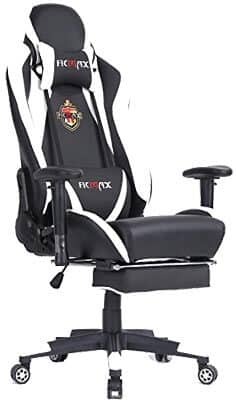 With quality manufacturing and an easy to sink into seat, this chair is definitely a top pick for gaming enthusiasts, or people who sit in a chair all day. This model has a larger design than some of their other chairs, specifically for individuals who aren’t small and skinny. The weight limit for this stylish chair is roughly 300 lbs, and people who are around 6 feet tall should have no issues fitting comfortably in this chair. The bold colors on this seat make a wonderful contrast against the black, and the overall color scheme is something that looks good in any home office. The included lumbar cushion helps maintain posture while sitting up, but can be removed should you choose to sit in any of the other available positions. The metal frame of the chair adds stability, but unfortunately, it can take away some of the comfort if you are accustomed to soft, foamy chairs. 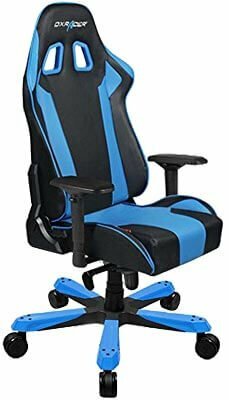 A quality chair doesn’t necessarily come cheap, but the good thing about buying a gaming computer chair from DXRacer is that you pay for what you get. 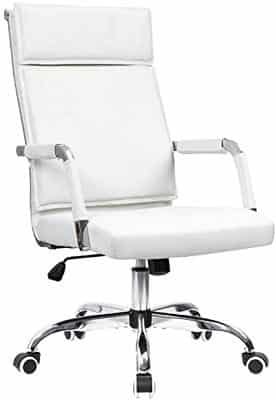 This particular model has many standard features, such as reclining back, and adjustable height, but it takes these features and improves upon them dramatically. The footrests are far from being typical footrests, and have a flatter base where you can rest your feet. The back of the chair is much higher, and can accommodate individuals over 6 feet with little compromises in comfort. The chair is made from polyurethane, a plastic that is designed to look and feel like the interior seat of a race car. You will feel more productive in this seat thanks to the cushioning pads within the chair, and the additional comfort of the lumbar and neck pillows to help you sit up straight. The metal frame is not easily broken, and can support up to 450 pounds of weight. This chair is massively heavy duty. Just like clothing, finding a chair that is both comfortable and stylish can be a headache. You want to ensure that the seat fits around your thighs, and the backrest supports your back and neck. The Ficmax gaming chair is an innovator when it comes to gaming chairs, and has features that enhance your experience at the desk. 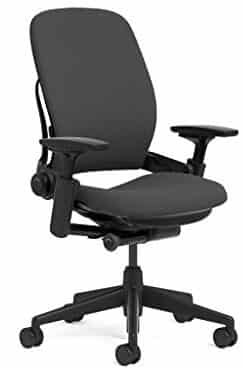 This 50-53 inch swivel chair possesses a USB lumbar massager that effectively reduces back fatigue from sitting for long periods of time, a plus if you are stuck at the computer for most of the day. It also has a wide standing base to ensure maximum stability. The Ficmax chair supports multiple angles for sitting; 90 degrees for office work, down to 150 degrees for rest. This gives you greater control over how you decide to work, as some positions are more comfortable than others. With a 300 pound weight limit, this is a very sturdy chair that is easy to set up and use right away. 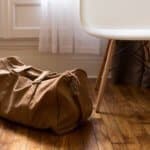 Plus, the stylish polyurethane stands up against spills, stains, and dust. 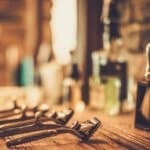 It is very easy to clean, and easier to maintain. 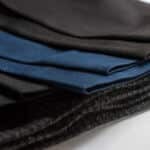 Polyurethane is a fantastic material to use if you want the look of leather, without the leather price or maintenance. It is essentially plastic, but feels so much better, especially on a chair. The Furmax is a PU chair that emulates the look of leather, but is very easy to maintain and is resistant to spills and stains. It’s a great chair to have in the office, and has multiple features that make sitting in front of a computer for 8+ hours enjoyable. This chair is extremely stable thanks to the 5 star base, and can hold up to 330 pounds of weight, making this chair exceptionally sturdy. It tilts back to allow for maximum comfort when resting, but also snaps up to 90 degrees to support the correct posture when working. Unlike other chairs, this chair does not have a metal frame. It instead uses wood and plastic to get the shape it has. The foam seat is decorated with bright, yet subdued colors, which adds a splash of personality to any office environment. The seat is about 21 inches wide and 19 inches deep, and the back is made to be tall, so anyone who hovers around the 6ft mark should have no problems getting comfy in this racing chair. If you find yourself spending a large part of your day at a desk with a sore back and aching shoulders, then chances are your chair isn’t doing what it’s supposed to. Finding an office chair that supports your back and helps your posture will go a long way to ensuring that your pain is minimized for long days in the office. 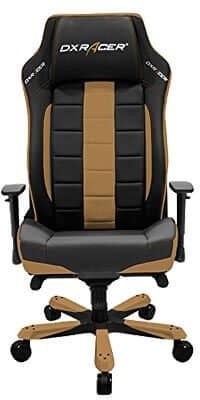 The GTracing ergonomic computer chair is specifically designed to support your back and guide you to proper sitting posture. It features a comfortable faux leather exterior and removable lumbar and neck pillows for maximum comfort. This chair is relatively inexpensive, and very good quality. 360 degree swivel, and up to 170 degrees when leaning back, this chair supports a wide variety of sitting positions. It is designed with a 330 pound weight limit, and is generous in the seat area for ample sitting room. 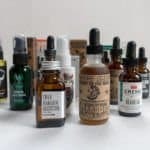 There is some assembly required upon receiving this product, but the instructions are easy to follow, and make a very sturdy and long lasting product. Your home office needs a good, sturdy chair, whether you need it for working or for gaming. A quality chair ensures that you can stay at the computer longer, allowing you to get more work done during the day. The Homall swivel chair is listed as being “leather”, but is actually made of polyurethane, a material used to emulate leather. This does not compromise the quality at all, but if you are expecting a leather computer chair, this is not it. The features of this chair include a sturdy base and quiet rolling wheels, as well as pillows for the back and neck that can be adjusted or removed entirely. This chair holds up to 300 pounds, standard across most chair models of this type. The color is nice and bold, and creates an interesting contrast throughout the chair. The back is 22 inches wide and 30 inches high, perfect for tall individuals. The seat is also 20 inches wide, so you should have ample room to move around in even while seated. 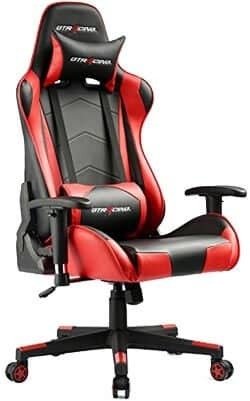 Overall, it’s a good quality gaming chair for a low price. It’s hard finding an office chair if you’re a bigger guy; many office chairs on the market are too small in the seat, or don’t provide enough support for the back. Even if you do find a chair that fits all your comfort needs, there aren’t enough nice looking chairs on the market. The Kinsal has redesigned a popular, tried and true chair to fit big and tall guys easier than standard competitors. This chair boasts a 22 inch width and a 25 inch depth in the seat for comfort and fit, and swivels around 360 degrees for maximum mobility. The wide base and smooth sliding wheels add stability while on the seat, and the easy to adjust height lever make this a very nice chair to sit on. It comes with a removable lumbar pillow to enhance your sitting posture and reduce back pain. Unfortunately, it is rated at 280 lbs; while that still is a respectable number, there are other chairs on the market that far surpass this weight limit for those that are a little bulkier. Ergonomic computer chairs are very popular for home and office use because of the benefits they impart onto your posture and overall health. Specially designed chairs such as the LANGRIA gaming chair will give you the most comfort while at your desk, for a price that’s easy to digest. This chair is equal parts stylish and functional, with it’s smooth poly covering and bright colored accents. It swivels around 360 degrees, and will lean back up to 170 degrees for resting at the desk. 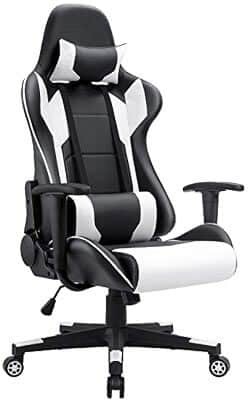 Additionally, this chair comes with a lower back pillow to further assist your posture, as most gaming office chairs do. The LANGRIA does one better by including an integrated foot rest, so you can prop up your feet at your desk for an ultra comfortable sitting experience. The armrests adjust, in case you need a little more wiggle room in your seat, and is sturdy enough to support up to 265 pounds comfortably. An ergonomic chair is a great thing to have in any home office. It helps your posture and reduces pain while sitting for long periods of time. If you are someone who spends all day at their desk for work or for play, a good quality chair is a fantastic investment. The Merax ergonomic office chair is an affordable mid-tier chair that features a cool looking, back friendly design. It is easily adjusted up or down using the lever under the chair, and as an added feature, this chair has a retractable foot rest. The chair is extremely supportive, and features both a neck and lumbar pillow for comfort and support. You can also adjust the armrests up and down, or you can shift them in or out to best suit your needs. The seat is not as hard as other chairs on the market, and is made with a softer foam for maximum comfort. Although it does not have a lot of features, it does have what is necessary, at a price that is more than reasonable. For men who aren’t keen on having fancy colored chairs in their offices, there are alternative solutions. Steelcase is one of the best manufacturers of computer chairs, and they opt for a sleek and elegant look that fits in any environment. Whether you want a computer chair for your home or for the office, you cannot go wrong with the Steelcase Leap chair. This chair is sturdy, and supports up to 300 lbs without suffering consequences in performance. The chair adjusts to your needs, and unlike other brands that only allow the arms to adjust in and out, the Leap chair’s arms can be pivoted, adjusted forward and backward, up and down to get an optimal arm rest for your arms. The seat is designed to be wider, offering a more comfortable seat for those who require a little extra room in the rear. Additionally, the backrest is made with a memory technology that forms to the shape of your spine with use. This allows for better posture and more comfortable seating. The only downside to this chair would be the price. Steelcase is a high quality manufacturer, and focuses on creating a product that reflects this. Gaming chairs don’t always have to look like they belong at an e-sports competition. Sometimes it’s good to go back to the basics with a simple black computer chair. The Vertagear is a call to the classics, a suave black office chair that aims to make sitting at your desk as comfortable as possible, while still giving you a wide variety of features to make this chair uniquely yours. The first thing users will notice with this chair is that it is incredibly easy to assemble; there is no need to call in a helping hand, as the whole chair can be assembled in 15 minutes. The heavy-duty frame can hold up to 440 pounds, due to the metal throughout the chair. It’s ideal for bigger and taller individuals that have problems sitting on commercial chairs, or are tired of other chairs bending and breaking. The tilt feature is easy to reach, and allows for someone to adjust the angle of the chair without having to readjust their position, which is a huge bonus in the middle of a game. Sophistication and class are the defining traits of this computer office chair. It is designed with every day use in mind, and reflects the look of traditional office chairs, but features so much more. This chair is almost completely adjustable, such as with the tilt of the backrest, but it is not as flexible as some of the other chairs on the market. Of course, for the price, it is still a very good chair. In fact, it is one of the higher quality chairs without contest. Some of the key features of this chair include an angled front edge of the seat, which takes pressure off of your thighs to allow for greater blood circulation to your legs. 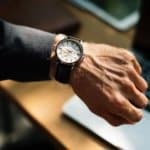 This is important when you spend 8+ hours in front of the computer. Pellicle suspension, which is Aeron’s signature design, is stretched over the chair to allow for greater heat dissipation, keeping you cool. 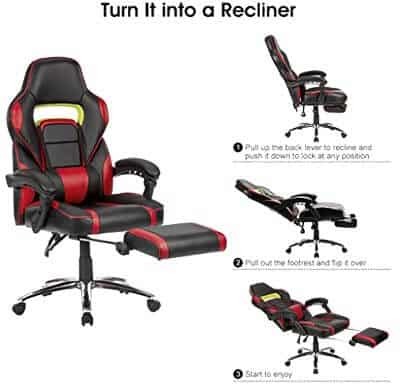 The chair is low maintenance, high quality, and works very well as a computer chair. It comes in three sizes; (A) is small, with a seat of 15 inches, (B) is medium, and (C) is large at 27 inches in the seat. 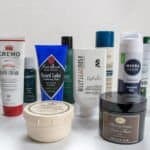 Very good for bigger gentlemen. 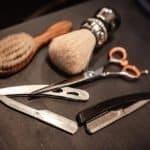 While we may outline the max weight that the gaming chairs featured within this article can handle, we also wanted to talk about another very important aspect – design. You see, when you go to your local office supply store to shop for chairs, many of them have a low price point as they are made from cheap and flimsy plastic. This will not only shorten the lifespan of the chair considerably, but won’t be functional at all for larger men. Therefore, when shopping for gaming chairs, it’s imperative that you seek out a chair that has a metal frame. This will ensure that the weight capacity will hold up for several years. Secondly, the chairs we outlined above have two additional key aspects to them. They have ample padding that will ensure long-term comfort for several uninterrupted hours of gaming along with having higher backrests for tall men. As you can quickly see in the table above, gaming chairs come in many different colors and design options. 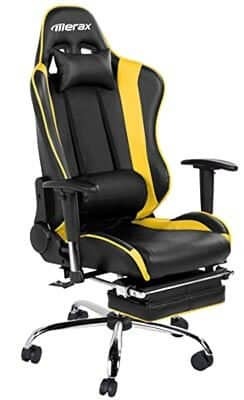 So if you want a design that is incredibly bold like the GTracing Ergonomic Office Chair with a head pillow and a recliner that can go back an astonishing 170 degrees – then it definitely can make for a sound addition to your home office. 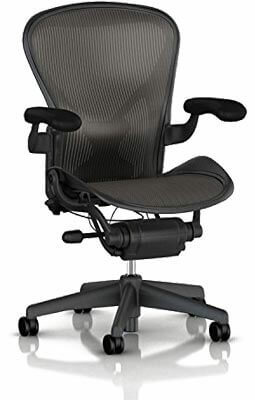 However, if you want a chair that, while not designed specifically for gaming, but has won countless awards for it’s overall comfort and design while retaining a conservative look that makes for a fine office chair, then the Herman Miller Classic Aeron Task Chair and Steelcase Leap Chair are second to none. Another key consideration when it comes to long term comfort, is a foot rest. While many of these chairs have been designed in a way that will ensure full circulation to your lower limbs, there is absolutely no denying just how comfortable chairs like the Ficmax Bucket Seat can be with it’s retractable foot rest. 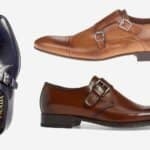 No matter the option that you choose, comfort is paramount.